Everyone loves a cute and cuddly dog- but what happens when you are bitten by a dog or domesticated animal? Dog bites in the United States are far more common than most people realize, with more than four million Americans bitten or attacked each year. According to the Center for Disease Control, one out of every five of these attacks requires medical attention or causes bodily injury. While this number may sound surprisingly high, there are plenty of ways you can handle the aftermath of a dog bite situation, and tips to prevent future attacks or potential for injury. The key is to act quickly in regards to a dog bite, to insure that you receive the proper treatment and any reparations owed you under California dog bite law. In the United States, the dog owner is considered responsible for the behavior of its animal, so if you have been attacked, the fault is most commonly placed on the dog. It is important to know your rights in terms of dog attacks, although it can be stressful to take legal action against an animal that is potentially someone’s “normally behaved” pet. It is best to consult with an accident attorney before proceeding on a case unguided. that is feeding or nursing puppies. If a dog suddenly becomes aggressive while playing with you, it is very important to remain as calm as possible, so the dog does not pick up on your agitation. It is always best to move away slowly, do not scream, and do not make eye contact with the dog in order to show the animal you are not a threat. If you have been bitten by a dog, it is important to act quickly and see a doctor if the wound is any more serious than a scrape, as you may need antibiotics. Seeking medical attention is crucial since dog bites can cause serious infections that will need further care than home treatment. Any bite that will not stop bleeding, is deep, was from a stray, or shows signs of infection including pus, redness, or swelling, should be immediately brought to the attention of a doctor. If the bite is not serious, it is important to use a clean cloth to stop the bleeding, then wash the cut with soap and water, before applying antibiotic ointment and a sterile bandage. Anytime you visit the doctor for a dog bite, you must be prepared to answer questions regarding both the animal and the attack. They will want to know if you were previously familiar with the animal, and whether or not you know the owner. A doctor would also like to know any information you have regarding the dog and whether or not it has received vaccinations against rabies. It is also very important to be honest about the state of your own personal health, because people with autoimmune diseases, liver problems, and diabetes are at a much higher risk for infection. The doctor will then clean your wound, examining its deepness, and the possibility that it will damage either your tendons, nerves, muscles, or bones. Depending on the severity and depth of the dog bite, you may need to reverse scarring and visible damage with plastic surgery. There is also the option of suturing the injury to close the wound and reduce scarring. However, utilizing a suture to close dog bites may increase risk of infection, so it is best to discuss the options with your doctor. While horror movies featuring dogs that have gone mad and are foaming at the mouth have raised our fear of infection from rabies, the actual chance of being infected with rabies in the United States is very low. However, if the dog was a stray or unknown it is important to get tested as a preventative measure against serious infection. If the status of the dog’s health is unknown or the dog does test positive for rabies, your doctor will administer the rabies vaccine. Treatment with antibiotics can last up to fourteen days, and it is common practice to return to the doctor up to three days following an attack to check for infection and the condition of the wound. If you did not know the dog who bit you, it is important to report the incident to your local police, in order to prevent further attack in the community. In California, the dog owner is liable to the person attacked by the dog, regardless of the dog’s former behavior or lack of viciousness. This is beneficial to the victim, as you are not required to prove any fault of the owner as long as there is proof of injury. In general, the dog owner can only attempt to defend the suit against his animal if he can prove that the injured party instigated and assumed the risk of attack. The liability statute applies to injuries sustained both in public places, or on private property. If you believe you have a case against the owner of the dog, it is best to speak with an accident attorney rather than go through the ordeal alone. 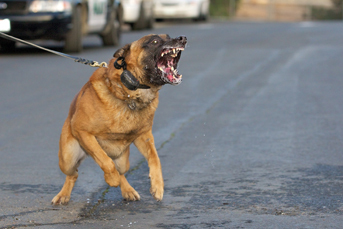 There are two classifications of “dangerous dog” behavior to be considered when building a case. The meaning of a “potentially dangerous dog” is any dog that requires a human to engage in defensive activity when unprovoked. The aggressive behavior has to occur on two separate occasions within the previous 36 month time frame for a dog to be deemed “potentially dangerous”. A “potentially dangerous dog” also can be any dog that causes non-severe injury after an unprovoked bite or attack, as well as any dog that has killed or seriously injured another domestic animal when both animals are on property other than the owners’. A “vicious dog” is classified as any dog that has exhibited aggressive behavior when unprovoked which led to the death or serious injury of any person. This includes any dogs which had been considered “potentially dangerous” and did not improve its aggressive behavior. In a case against a dog bite in California, a serious injury that will mark a dog as vicious can include lacerations which cause physical disfigurement, muscle tears, or any bite which requires either a suture or plastic surgery. Any time a person is bitten and injured by a dog, the owner is held liable under California law. The owner will face a fine up to $500 in general. However, the owner of a dog within the “vicious dog” category or a dog with previous dangerous offences can face fines up to $1000, as well as liability in any case against the animal. The above tips are brought to you by Los Angeles personal injury attorney, James K Sadigh. James Sadigh has extensive background and experience acting as an injury lawyer in the Los Angeles area, and is fully dedicated to protecting his clients’ rights in the eyes of California law. James Sadigh’s experience will support you wholeheartedly through your personal injury lawsuits.